Q: What does PNC stand for? A: Pastor Nominating Committee. The PNC was elected in November 2016 by the Congregation to search for a Pastor to be presented to it at a subsequent date. Q: What is a MIF and a PIF? A: MIF is an abbreviation for the Mission Information Form. 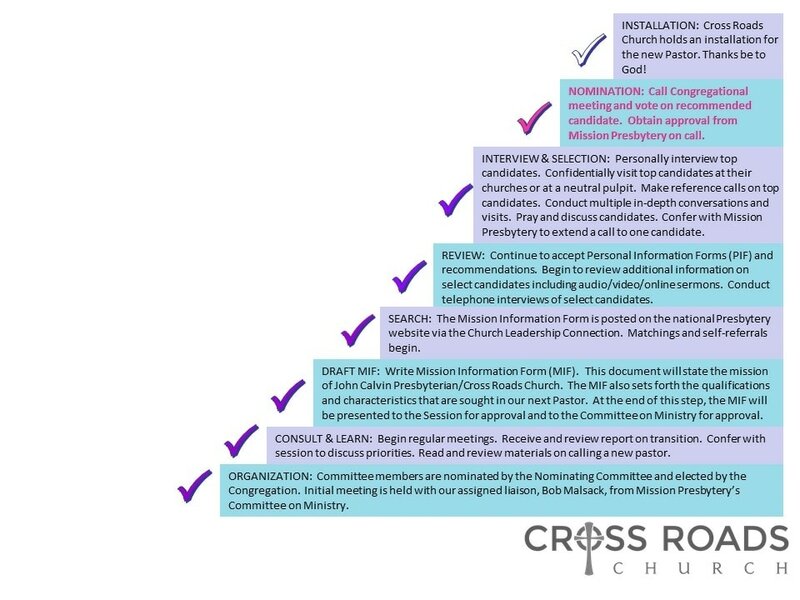 This is the document that describes JCPC/Cross Roads Church to potential candidates for our Pastor vacancy, and also describes the qualities and characteristics we are looking for in a pastor. A PIF is a Personal Information Form and contains the information that a traditional resume would have. It is the document that we will receive from candidates interested in the position or who have been matched to us through the Presbyterian Church (USA)’s Church Leadership Connection. A: The Presbyterian Church (USA) determines the process we must follow in selection our next pastor. Throughout the process, we must follow the guidelines provided by the Book of Order and consult with our local presbytery. In fact, the PNC is assigned a representative from the Committee on Ministry (COM) to aid us through this process. All of this is designed to allow a fair and open search process and allow sufficient time for prayer and discernment. As a result, there is no set timetable. Q: Will we be able to find out who the PNC is considering? A:Due to the confidential nature of a pastoral search, the PNC will only present one candidate to the Congregation and cannot disclose other candidates that may be considered. If the candidate presented to the Congregation is not acceptable, the PNC will continue the search process. A: The most important thing you can do to help is to pray for the members of the PNC, as they discern God’s will for JCPC/Cross Roads Church and consider potential candidates. In our search for a suitable pastor, the following notes have been assembled as to progress to date. Of the candidates investigated by the committee, only one was found to have the necessary qualities to serve our congregation in the office of Senior Pastor. The following list contains the names of the candidates and findings on each. MOSES: It is believed that he committed murder. He stutters. His former congregation reported that he loses his temper over trivial things. SOLOMON: He has an honorable reputation for wisdom but fails to practice what he preaches. HOSEA: His family life is in shambles; divorced and remarried to a practitioner of a pagan religion who may even be a prostitute. JOHN: He says he is a Baptist but lacks tact and dresses like a hippie. Would not feel comfortable at a church potluck supper due to his non-standard food requirements. PETER: Has a bad temper and is believed to have denied Christ publicly, maybe more than once. PAUL: We found him to lack tact. He is too harsh, his appearance is contemptible and his sermons are far too long.